Today’s Escapist has a piece of mine called “D&D Is the Apocalypse,” tracing the importance of the apocalypse to the earliest development of the game and examining why it continues to be an essential part of the default D&D setting. My research for this article was greatly aided by posters in two threads I started at the OD&D boards, especially geoffrey (creator of Carcosa) and aldarron (creator of Dragons at Dawn). Perhaps in order to get in all the scholarship they contributed – or because as someone who used to to do neuroscience I am still uncomfortable making assertions not backed up by a lot of footnotes – my original draft had a comprehensive rundown of every apocalypic reference I could find in the original campaign settings and the literary sources Gygax listed in Appendix N of the Dungeon Master’s Guide. Tekumel is the first D&D campaign setting to be published, if you grant that Empire of the Petal Throne (1975) is basically a set of D&D house rules. The nature of the “Time of Darkness” apocalypse is not specified, although the quote Geoffrey supplied & which I used in the article gives many evocative details about its effects. It’s worth noting that Tekumel predates D&D, as Barker had been imagining it since he was a kid and only translated it to a RPG after seeing some of Arneson’s circle playing D&D at the University of Minnesota gaming club. If, as seems likely, the Time of Darkness was part of this pre-existing history, this supports the idea that the apocalypse entered gaming via literary sources and relevance to contemporary events, but persisted because it makes for a good game. The Greyhawk supplement was published earlier (in February of 1975 according to the Acaeum) but has very little information about the setting of the Greyhawk campaign. Although others may have been discussed in Dragon or other fanzines, the first explicitly post-apocalyptic references I know of in Greyhawk appear in the 1980 Folio, where the Sea of Dust covers the remains of the Suel Empire destroyed by the Rain of Colorless Fire after they brought down the Invoked Devastation on the Bakluni Empire. The Sea of Dust is visited by the characters in Andre Norton’s Quag Keep (1978), the first novel based on a RPG, but it’s not clear whether it is the ruins of a former empire. I don’t know whether this element was added when Gygax revised the setting for publication, or if it was already part of Greyhawk by 1978 but Norton didn’t pick up on it. The Blackmoor supplement, first published in September of 1975, has the last surviving pipe organ that I talk about in the piece. 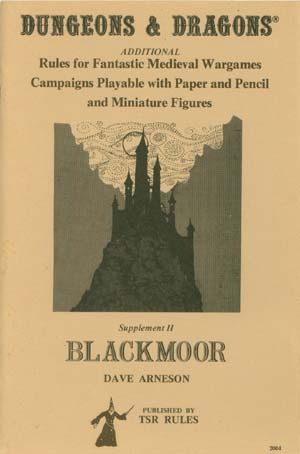 Arneson’s webpage says that Blackmoor was slated to be published first, and there’s no doubt that this was the first proto-D&D campaign. Having played with both Barker and Gygax makes Arneson a good candidate for transmitting an apocalyptic meme, but I think it’s more likely to have arisen independently in each of these campaign worlds. City State of the Invincible Overlord, the inaugural product set in Bob Bledsaw’s Wilderlands, was released at Gen Con in August of 1976. Its millennia-long chronology that includes the Uttermost War and other cataclysmic events is, along with Tekumel, the clearest statement of the post-apocalyptic nature of the early RPG settings. – Moorcock’s Hawkmoon series is set in an after-the-bomb Granbretan where, following the Tragic Millenium, swinging London is dimly remembered as having been ruled by those “terrifying ancient gods”, mop-tops Jhone, Jhorg, Phowl and Rhunga. – The subterranean complex in Margaret St. Clair’s Sign of the Labrys (1963), the closest thing to a multi-level dungeon with secret doors and teleporters you’ll find in the pre-D&D literature, is a 20th century bomb shelter appropriated by the survivors of the “yeast plagues”. – In Fred Saberhagen’s Changeling Earth, sorcerers invoke an atom-powered tank and a demon brought to life by a nuclear explosion. – Sterling Lanier’s Hiero’s Journey, set centuries after a nuclear holocaust, features scenes of psionic combat with strange fungi that strongly resemble a late-‘70s D&D session. – Vance’s Dying Earth stories are rife with apocalypse, from the relics of antediluvian empires to the looming extinction of the sun. In a previous blog post I talked about how Gygax hardwired these assumptions into AD&D. I kept in the bit about how apocalypse breeds the anarchy that S. John Ross identifies as one of the “Five Elements of Commercial Appeal in RPG Design,” but for the sake of space I left out how it enhances Ross’s other four elements: it’s a well-loved Cliché that draws a veil over the past to make it an Enigma and atomizes the law enforcement that stops people from engaging in frequent Combat, which in turn enhances Fellowship by making it dangerous to go anywhere without your buds to watch your back. I’ll be interested to hear other examples of apocalyptic themes in early (or late) D&D, as I’m sure there are many I missed! I believe that the popularity of the apocalypse in late 70s / early 80s gaming stems from the period’s ever-present fear of nuclear war. In the case of Greyhawk, the Invoked Devastation and the Rain of Colorless Fire clearly represent a case of Mutually Assured Destruction in action. Do you think there are two collaborative but separate threads here intertwining? You have the idea of an impending apocalypse ignited by the worthies of the era clashing swords on one hand; on the other, artifacts of a ruined and lost world poking its mysteries through the soil. It’s intriguing to see them as Cold War heirlooms, but they have historical precedents as well. The cataclysm of heroes can be traced to the Norse myths of Ragnarok, at the very least, where Valhalla is emptied of its souls and Balder ascends the Rainbow Bridge and all that stuff. Good old fashioned eschatology. The ‘old weird stuff lying around’ is more explicitly historical, where Roman bric-a-brac – aquaducts, broken roads, columns – were all over the place and the technology to regain them utterly missing. Arthurian legend has this sad sense of doom and absent glory — the King floating over to Avalon picks up on this lilting sadness (also seen in LotRs with Bilbo vanishing and the others, later). Fred, I just sent Greg an email to see if he’s your guy but he’s out at E3, the poor hard-working slob. You can see a picture of him in his Escapist profile here, but do not read his twitter feed lest you become overwhelmed with sympathy for the terrible labors, including seeing Lady Gaga perform, that seem to be required of their staffers. Eric, the Suel/Bakluni exchange is definitely the canonical example, and I persist in thinking that subterranean bomb shelters were at least a subconscious inspiration for dungeon complexes (even if Arneson said during the seminar I mention in the piece that their genesis was functional rather than literary). However, I think the reason fallen empires are a design principle in 4E also has more to do with its functional utility than with contemporary fears or a desire to honor that aspect of D&D’s heritage. Nudist, I see the looming apocalypse and the rebirth of the new world (haunted by remnants of the old) as flip sides of the same coin. SF works like A Canticle for Leibowitz span the range from one to the next, and I think Atlantis gets used both for “our shining achievements will be drowned beneath the waves” and “once there were giants in the earth”. But yeah, the real history of our ancestors growing up among monuments to past glory certainly informs some of D&D’s medievalism and classicism, just as I think the archaeology of ruined temples full of gold relics and statues depicting human sacrifice and (scarier still) bare-breasted temptresses informs the pulp adventures that are another important contributor to D&D’s genome. I just finished Canticle for Leibowitz last night. Wow. Uncanny. As Cold War tensions have receded, pre-cataclysm D&D civilizations have become less explicitly technological and similar to our own. Nowadays the apocalypse rarely involves a mushroom cloud, because we have less need to be reassured that some will survive, likely gaining cool mutations or the ability to cast spells in the aftermath. This makes me wonder…would a world more or less like ours burned down by the follows of a fanatical “lawful neutral” god whose followers finally burned themselves out on their own quest for purity serve as the modern background equivalent. It could address fears of religious fundamentalism I see from people who both fear it internally (mostly Christian) and externally (mostly Islamic). Or is that too abstract and too real at the same time? I dunno about anybody else, but I’d like to see the version with all the references in it.